A leaning metal pole holds up a stack of signs pointing in different directions. 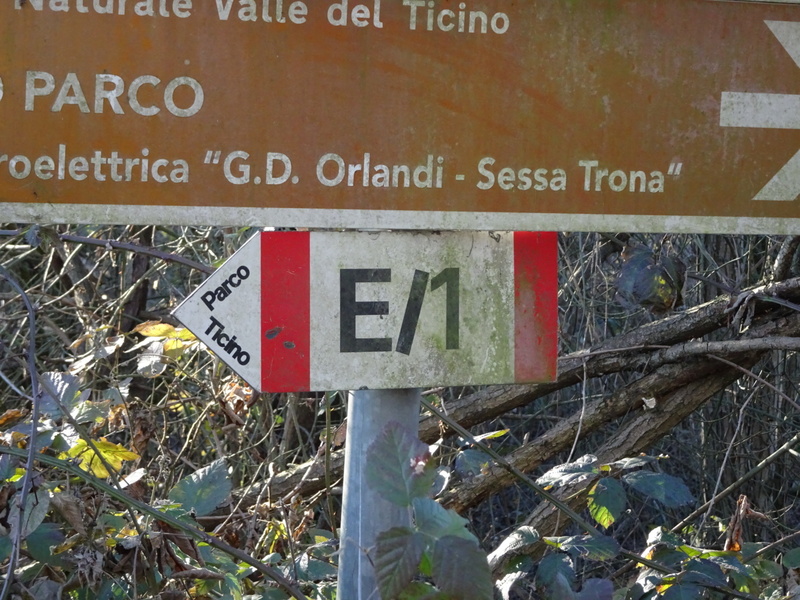 At the bottom, a small red and white one with “E/1” written in black points to the south. Overgrown brush almost swallows it, the paint is covered in grime, and the whole post looks forgotten alongside the road. I stare at it for a while. I wonder when the last person passed who saw the little sign, who cared, who knew what it was. The first sign for the E1 was at Nordkapp. It was a stone block set in the ground with E1 carved into it and the red T that marks Norwegian trails painted on top. Among the signs and statues littering Nordkapp, no one paid it much attention at all. It sat there unobserved among a sea of people taking pictures of something else. The E1 vanished for long stretches as I walked across Scandinavia, hiding behind the names of smaller trails and paths, but it was there, emerging to wink at me from a bit of paint or carved into a wooden sign where I never expected it. I’d look at it each time, caught by the oddity of seeing the trail’s name even though I knew it was there under my steps. It always seemed more a concept than real. In Germany it became a white X on black, sometimes painted, sometimes a square metal sign, sometimes just a sticker stuck on a metal pole, a wall, or railing, but almost always there. It became a comfort, the E1, my trail, the way leading me through villages and past bakeries. Just when I’d begin to doubt a white X would arrive to point the way. In Switzerland it disappeared again, fading back into other trails to re-emerge in Italy. This time it was red and white with a slash between the E and the 1 like the sign in front of me, usually metal, but sometimes wood, hanging from old posts, on walls, alongside roads. I didn’t always follow the trail. More than once I’ve cussed at it and stomped off on my own way or lost it on accident and let it be until I found it again. I detoured to mountain tops and cities. I cut off strange bends that didn’t make sense. I zigged when it zagged. But it was always there somewhere, underneath me or nearby, guiding me south. It’s seen me cry in frustration and stare in awe. It’s watched me wear down in the rain and shout at the sun to break through the clouds. It’s marched through bogs with Theodore Jones and across Gotthard Pass with Fritz. It’s been constant as borders, languages, and landscapes shifted around it. I look at the scrap of metal nailed to the post. It will be the last E1 sign I see. I thought it would end earlier. I thought it would be north of the Alps somewhere, but instead it’s here at this nothing intersection. I frown at the vines climbing toward it, at the flat, nothing kind of road junction that I’d forget in a few minutes if it weren’t for the sign. It is a hard spot to say goodbye to an old friend. “It’s time to turn west,” I say. The sign says nothing. It just hangs there pointing south. I walk a few minutes and connect to an old canal shooting straight west across the Po Valley. High, flat tow paths run along each side, dirt tracks ready to carry me for miles and miles. I scramble up one and walk easy, no cars to think about, nothing to do but walk and stare at the rim of mountains in the distance. It’s the E1’s last gift, the tow path. It put me on a canal this morning, reminded me of how easy they are to walk beside, then left me to find my own heading west instead of the road I’d planned out. The roar of a freeway comes and goes in the distance. Trains streak by. I walk. Small towns come and go. Canals shoot off to water fields. Nutria scamper away and plop into the water to disappear. I walk into the night, eating away at the miles, watching distant mountains color and fade as the stars blink into existence. It’s a good day, a long day, the two-hundredth day on the trail. Posted in Europe North to SouthTagged backpacking, E1, ENS, Europe North to South, featured, hiking, Italy, thru-hikingBookmark the permalink. It’s funny, the connection you make with a trail. It really does become an old friend, with all the ups and downs that come with that. So good to hear your summary of the way this trail business has been for you. Of course, there never was any set plan for your journey, which is the finest way to do such a walk (or any thing in life for that matter). And, of course, there never is one for you, Daniel, as you are famous for going off on side trails or making one up for yourself, or finding ones that were used ages ago and long since not used until you search and find them. Kudos to you, and may your hike for a while do you well to make good miles and be in more fair weather for a time. Blessings Be! D. Looked up E1 on Wikipedia. It terminates in Sicily, not in Spain. Let us know when you make a turn west and the trail that will take you to the southern most point in Spain. Namaste.